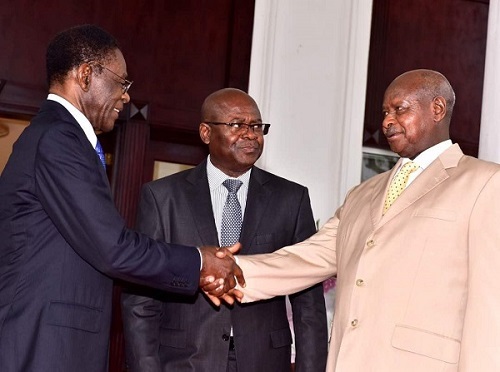 At the invitation of His Excellency Yoweri Kaguta Museveni , President of the Republic of Uganda, His Excellency Teodoro Obiang Nguema Mbasogo, President of Equatorial Guinea paid a one day official visit to Uganda on 25th January 2018. His Excellency Teodoro Obiang Nguema Mbasogo was accompanied by H.E. Alejandro Evuna Owono Asangano, Minister in-charge of Presidential Missions, H.E Juan Antonio Bibang Nehuchuma, Minister Delegate for External Security, H.E Armanda Dugan Champion, Vice Minister in-charge of Ceremonies and other seniors Government officials.